I wanted to repost this and share it with my readers as well. I am studying to be a cosmetologist as a hair stylist and makeup artist and I believe it is important for everyone to know this. This is another reason why certain types of BOX COLOR can be bad for you. WARNING: Can your hair dye can kill you!? Studies show that at least 75% of American women color (lighten or darken) their hair. Way more than the 7% that colored their hair in the 1950's. And it's not just women, last year men's at-home hair color sales reached over 113.5 million dollars! But what isn't being shown on any commercials for hair color is the fact that one of the main ingredients in 2/3 of hair color is hospitalizing and even killing people. The FDA does not approve it to touch your scalp...but it does and not many people know about it. AND YOU CAN HAVE A REACTION ON YOUR 1ST HAIR COLOR APPLICATION OR YOUR 37TH! And no the patch test will not guarantee anything- they said you can have a reaction to the PPD even after you've used the same product safely for years. Just last week, Tabatha McCourt, 17, began pulling at her shoulder-length locks, screaming and vomiting before collapsing in agony at a friend’s house. A short 20 minutes after applying hair color to her hair, Tabatha, who had died her hair many colors, died. The doctor reported is was a chemical called p-Phenylenediamine that had reportedly been suggested as a cause for the sudden reaction. 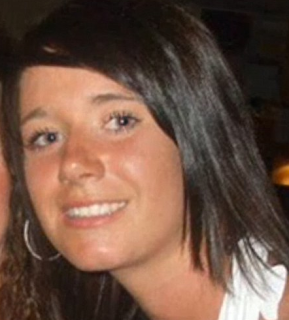 'There was yellow pus oozing from my scalp and it had the most horrific smell of burning flesh. 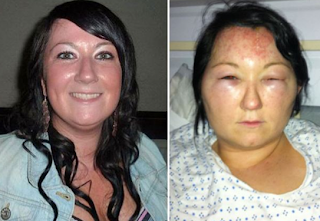 'Both my eyes swelled up and the skin at the side of my earlobes was really swollen and itchy. 'The worst part was the awful pus that was still oozing from my head all the time. 3 hours later she had to return, this time being hospitalized for 3 days. One of the doctors asked her if she had ever heard of the chemical PPD. An ingredient in many hair dyes, para-phenylenediamine (PPD) is a common allergen banned in many European countries. People can become allergic to it at any time, even if they have been exposed to it before without problems. For this reason, it was voted Allergen Of The Year in 2006 by the American Contact Dermatitis Society. developer, oil, gasoline, ink, textile dyes, dark cosmetics and hair dye. The European Union classifies it as a toxin and irritant that is dangerous in the environment. In Canada, its use in cosmetics is restricted and it was banned in France, Germany and Sweden. PPD is a neurotoxin and is even used in anti-freeze. And it causes Cancer: Laboratory experiments have shown that PPD damages the DNA of human cells. Accumulated DNA damage leads to cancer. Hair stylists who color hair at work do have higher cancer levels. Studies have shown that hair stylists have higher rates of skin allergies, asthma and breast cancer, so the risks for stylists are real. • Hairstylists and barbers with just one year or more occupational exposure to permanent hair dyes were 50% more likely to have bladder cancer than those who did not. This increased to five times — 500% — more with 10 years of professional exposure. The Scientific Committee for Cosmetic and Non-Food Products is fully aware of the dangers of PPD. • Women who used permanent self-administered hair dye at least once a month for a year or longer were twice as likely as women who did not use permanent hair dye to develop bladder cancer. • Those women who used permanent dye monthly for 15 years or more were more than three times as likely to develop bladder cancer as non-dye users. But did you know that certain ingredients are causing women and men to get thinner and thinner hair, and in some cases hair dye has even taken lives. This is something that many big companies are not talking about, because this would put a major dent in their millions of dollars in sales. And dark hair colors seem to be the most dangerous. Great, I've been dying my hair different colors for years! And I wonder why my hair is so thin! So what's a girl or guy who wants to dye their hair or cover their gray to do? No worries, we just have to make sure what we're using or where we're going uses hair color without PPD. Do a little research before you head to the store to buy hair color or before you head to the salon to get your hair colored- and remember to look for the other names PPD is labeled as above. There are natural alternatives too! I've never tried any, (my mom uses them all the time) but I think I'm going to start! *as well as Clairol Loving Care. (Oh good...because I've used Goldwell in the past!) I'm sure there's more but these are the only ones I know of right now. 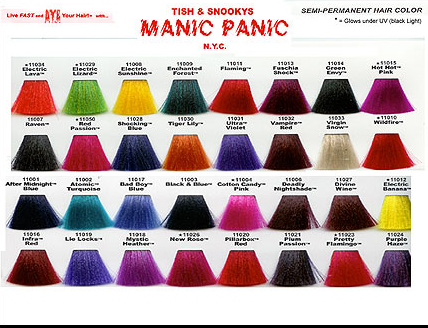 MANIC PANIC- your fun, rainbow colored hair dye is free of PPD! YAY! Fun colors AND safe! Thanks Tish and Snooky (not of Jersey Shore fame)...for making this! 4. Advanced Cosmetic Technologies - formulated with natural plant dyes and easily removed with vinegar or lemon juice. Henna is another alternative. 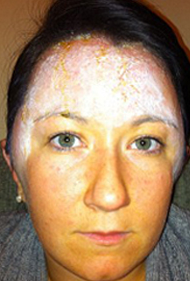 Henna reacts on the outside of the hair shaft, where "normal" hair dye works by penetrating the inner part of the hair shaft. Henna Options- please check, Henna can cause different allergic reactions too. And do NOT use anything labeled "black henna", that is PPD as well. No one is talking about this enough, some doctors, Cancer Research Centers and universities and even Lance Armstrong's LIVESTRONG site have been trying to spread the word too. (I am pleading no comment on how the FDA approves things. ha ha ha) Please feel free to email this, post this, tweet this to help get the word out to help your friends and family be aware of this. Not to freak everyone out, or make everyone think they can never color their hair...I just don't want to hear of another girl dying or having their flesh burned, or coming down with cancer from their hair color. Just do a little research before you go out to get a fresh dose of hair color! Huge love and feeling horrible about not knowing about this and just slapping on all kinds of hair color on my hair for years now...I will be carefully be reading labels or buying the healthy hair color if I feel the need to color my hair! See, another reason why the Ombre hair style is/was great- it doesn't touch your scalp!